Now that we have introduced ‘government money‘ and ‘commercial bank money‘, we are in a position to understand in basic terms how fiscal policy (government spending and taxing) is conducted and its direct financial effects. At this stage, the treatment is still cursory. There are more details that can be added in at a later time. In the initial instance, acts of government spending are authorized at the legislative level. For example, in the US, government spending is authorized by Congress. The Treasury then has the go-ahead to initiate spending operations. Instructs banks to credit the accounts of spending recipients. The government spending, in addition to creating income for the spending recipients (see part 9), causes an increase in the net financial assets (financial assets minus financial liabilities) of non-government. In the above figure, the actions of the Treasury and central bank are combined into a single consolidated T-Account. Any intragovernment transactions between the Treasury and central bank net to zero, and so are left out. Only transactions between government and non-government show up in the consolidated government’s T-Account. We can determine the overall financial impact of the government spending by considering its effects on each non-government entity. On the one hand, River Bank’s net position is unchanged. The bank has extra reserves, which is its asset, but this is exactly offset by the new deposit, which is its liability. Minnie, on the other hand, has a new asset (her deposit) with no offsetting liability. So, for non-government as a whole, there has been an increase in financial assets relative to financial liabilities. In other words, there has been an increase in net financial assets. This is possible, even though financial assets and liabilities for the system as a whole must sum to zero, because the extra financial asset held by non-government is matched by an extra financial liability for government. Namely, the extra reserves, which are an asset of River Bank, are a liability of the consolidated government sector. The change in net financial assets, as presented so far, equals the change in reserves of $1,000. Taxes have a financial impact opposite to that of government spending. If Minnie Motza pays $300 in taxes, this amount will be debited from her account at River Bank, and $300 of reserves will be debited from River Bank’s account with the central bank. The net effect will be a reduction in non-government net financial assets. For River Bank, the impact is neutral. Its liability (Minnie’s deposit) is reduced by $300, but its asset (reserves at the central bank) is reduced by the same amount. Minnie, however, has less financial assets than before, since her account now has a smaller balance. Offsetting this is a reduction in the government’s liabilities (since there are less reserves in River Bank’s account with the central bank). Once again, the change in net financial assets, as presented so far, equals the change in reserves. In most countries, governments neutralize the fiscal impacts on reserves by buying or selling treasuries (or government bonds). This can involve the fiscal authority issuing new treasuries. Or it can involve the monetary authority buying or selling previously-issued treasuries. In either case, these actions relate to monetary policy. They enable the central bank to target a short-term interest rate. We will get to this in a later post. For now, we just need to note that when government spending exceeds tax payments (a fiscal deficit), the government will sell treasuries to non-government. Non-government payments for the treasuries cause bank accounts and reserve accounts to be debited. In this way, a government sale of treasuries eliminates excess reserves. Conversely, when tax payments exceed government spending (a fiscal surplus), the central bank will buy treasuries. The central bank pays for the treasuries by crediting reserve accounts and instructing banks to credit appropriate accounts. This prevents a shortage of reserves. These actions alter the composition of net financial assets but have no direct impact on the level of net financial assets. In the case of a fiscal deficit, the government’s sale of treasuries means that non-government will hold its extra financial assets in the form of treasuries rather than reserves. This is akin to an individual switching funds from a checking account (or current account), which attracts little or no interest, to a savings account (or term deposit) that pays interest. In the case of a fiscal surplus, the central bank’s purchase of previously-issued treasuries means that non-government will possess less treasuries rather than less reserves. The key takeaway is that government spending adds net financial assets, whereas taxes subtract them. The reason for this is that all other assets have an offsetting liability within the non-government sector. For example, Minnie’s deposit, which is her asset, is a liability of River Bank. For the non-government as a whole, this non-government-issued liability has its accounting offset in the non-government sector, and so nets to zero. The only way non-government can acquire net financial assets is for government to issue more cash, reserves and treasuries than it imposes in taxes. This occurs when government spends more than it taxes. Peter, can I suggest that you start your diagram with the US Federal Treasury (in your case). It is the sovereign currency issuer, the Federal Reserve Bank (FED) is not. The FED operates with a Balance Sheet; like all commercial banks, it has to balance. For instance, the $1,000 wages paid by the government (US Treasury) would appear as a $1,000 “reserve” in the central banks “assets” column for the credit of its own customer, the River Bank. The deposit in the River Banks customer account (Motza) would be the balancing liability. Motza could take the $1,000 out of River Bank as cash, in which case the River Bank would swap the $1,000 “reserve” at the FED for cash. Motza could transfer the $1,000 electronically to another commercial bank, in which case the FED would move the $1,000 “reserve” to the credit of the new commercial bank. 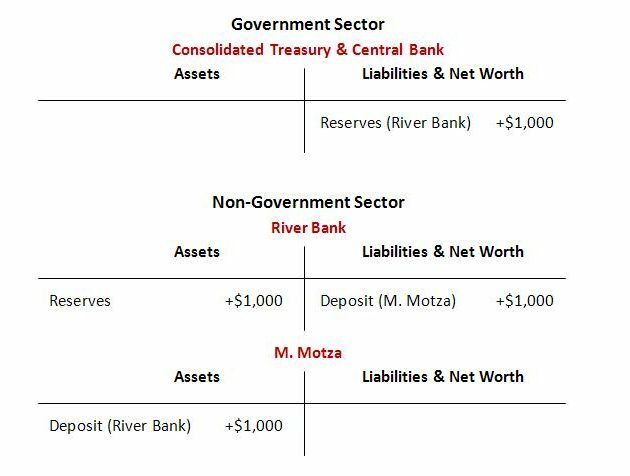 Motza could have bought a $1,000 US Treasury Bond, in which case the FED would move the $1,000 River Bank “reserve”, to the FED’s “securities” account. Hence, the top of your diagram would then have the Treasury with zero assets and a $1,000 liability, which is technically correct. The Treasury has no assets and doesn’t need any as the currency issuer; or, you could equally say it has infinite $ assets as the $ currency issuer. Hi acorn. I was trying to avoid showing anything in the T-Accounts other than steps 1 and 2 described prior — the creation of ‘government money’ and ‘deposit money’. I considered showing, in relation to the US case, Treasury with a reduced Treasury Account and the central bank with a reduced liability to the Treasury (the reduced Treasury Account). My thinking is that the direct act of spending (as opposed to the various procedures leading up to it, including repurchase agreement, treasury issuance and a call in of funds from tax and loan accounts in the US case) is a creation of reserves and deposits. I take your point that the financial assets and liabilities of the central bank need to balance, but I tried to warn the reader by mentioning that other balance-sheet entries are left out. I didn’t really consider the intra-government changes as important for the purpose of the post, which was to explain the source of net financial assets. For a similar reason, I chose just to describe the swap of reserves for treasuries in the text rather than add more details to the T-Accounts. My thinking was that the net financial assets are created by the crediting of reserves and bank balances. The treasury issuance just changes their composition. I’m sure you’re already aware of this, but for others who may be reading, Scott Fullwiler has previously broken down the US procedures into six steps. I didn’t think it was worth going into them here. I have summarized them in an earlier post. The present post is meant as a segue into the sectoral balances identity. However … if you think it is really necessary, I will defer to your greater knowledge on the topic, and add in a bit more detail. Let me know if you think it is. Thanks for your thoughts, as always. Or maybe I should just relabel the central bank T-Account as a consolidated government one, and otherwise leave as is. Update: I’ve now done this and inserted a bit more text. Further changes can be added if needed. My comment concerns the current arguments about the “unwinding” of Quantitative Easing (QE). Trying to explain the fact that QE is not a money printing process, but a money swapping process; the net financial assets in the economy do not change at the moment of the swap. The central bank swaps the government bond back into the reserves/cash that bought the bond in the first instance. Money, that is “reserves”, that had been previously spent into existence by the Treasury. The distinction between the Treasury and the Central Bank is useful for such argument. In sovereign fiat currency accounting terms the Treasury and the Central Bank are one and the same. Hence, when the central bank exchanges a government bond back into cash, the Treasury gets its own bond back and ends up paying itself the interest on the bond, via its own central bank. The bottom line is, once the central bank is holding the bond, it is the same as if the Treasury had never issued that bond in the first instance. There is nothing to “unwind”; the original reserves/cash, is back out in the economy, presumably still being saved on some other platform like commodities; stocks/shares and property. Keep up the good work Peter, one day MMT will make the quantum leap into the mainstream. No need at all to apologize, acorn. Your contributions are much appreciated. Monetary and banking operations are not my strong suit, so your additional insights and explanations are helpful for me..